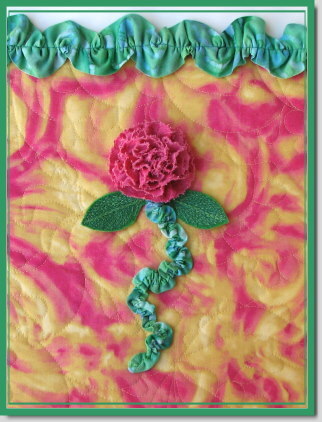 When the quilting stage was complete, I picked out a green batik fabric for the stem of my flower and for the decorative ruched trim. Both of these were constructed the same way. 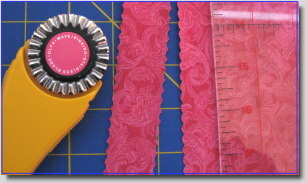 For the stem, I cut a bias strip of fabric 1 1/4 inches wide. For the ruched trim, I cut a strip on the cross grain 3 inches wide. After folding the strips right side together, I sewed a 1/4 inch seam down the length of the strip. 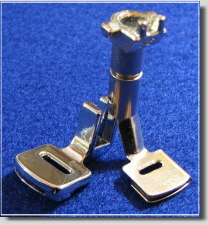 I then turned the strips right side out using a tube turner and pressed them, centering the seam line on the back side. To form the ruching, I accordion folded the strips about every inch. 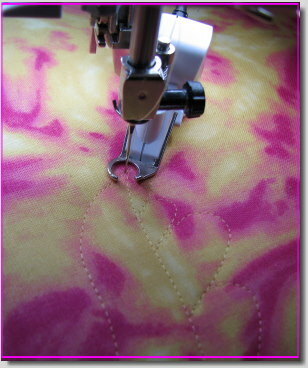 I then set up my sewing machine with a straight stitch at 4.5 mm in length. 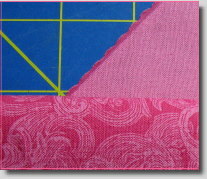 Starting at one corner, I sewed diagonally from fold to fold (a zig zag pattern), letting my stitches comes as close to the edge as possible without leaving the fabric. When I completed the stitching, I then took one thread tail in hand and gently pulled on it while pushing the fabric in the opposite direction. I continued doing this until the complete strip was gathered and ruched. With the flower and stem complete, I now moved on to the leaves. 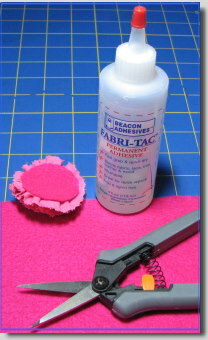 Using green craft felt, I cut a 4-inch square and backed it with Decor Bond. I then used a fabric pen to draw two basic leaf shapes on the felt. I wanted my leaves to have the same coloring as the stem, so I picked out a few thread colors that matched the batik fabric. Starting with the darkest shade, I thread painted the interior leaves. I then detailed them with the lighter colors. 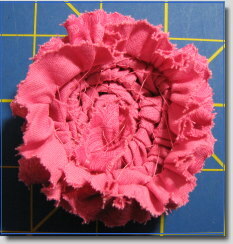 My flower was now ready to be placed on the quilted fabric. 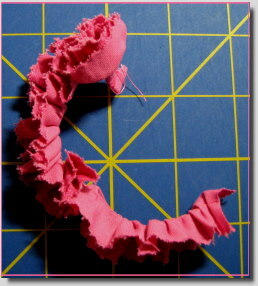 First, I positioned the ruched stem and lightly tacked it down with a dab of fabric glue here and there. Next, I placed the leaves in position the same way. I then threaded a hand sewing needle with the tail of thread from the tip of the ruched stem and brought it to the back side, where I secured it with a knot. Finally, I attached the flower. When all was in place, I hand stitched the whole composition from the back side, bringing this project to completion. I hope you will try some of these techniques in the near future. 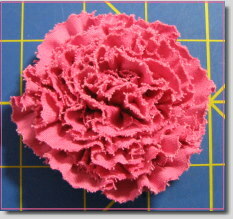 These little flowers are wonderful on prom dresses, hats, handbags, and other similar items. Have fun!